When it comes to wilderness chores, sometimes simple and straightforward is the best approach. The ESEE Camp-Lore PR4 is Patrick Rollins' take on Horace Kephart's classic design. The original prototype was made by James Gibson and tested extensively by Patrick during survival classes, off-trail backpacking, hiking and camping. The Rowen built production PR4 features a 4″ blade with a 4.75″ handle, 1/8″ thick 1095 HC steel blade, 90 degree spine for striking a Ferro rod and a leather pouch sheath. It may not be pretty but it is designed to work, like all the other ESEE Knives. 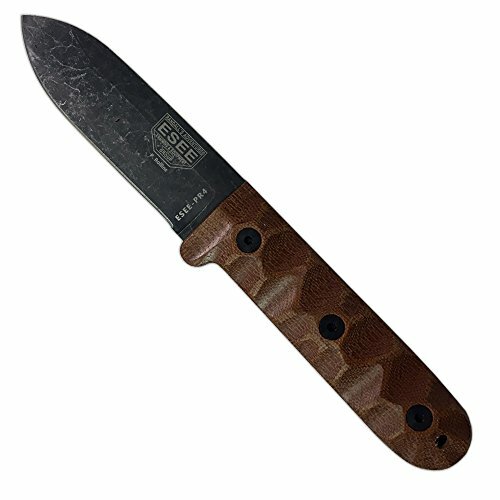 ESEE carbon steel knives are made from 1095 steel. While 1095 is a top choice for professional cutlery designed for hard use, it will rust and stain if not properly cared for - especially on the cutting edge and around the laser engraving. It is the user's responsibility to keep the blades properly lubricated and cleaned. ESEE suggest using a dry film rust inhibitor such as TUF-GLIDE or TUF-CLOTH. Overall Length: 8.90 inches. Blade Overall Length: 4.19 inches. Cutting Edge Length: 4.0 inches. Thickness: .125 inches. Weight (without sheath): 6.3 ounces. Steel: 1095 Carbon, 55-57 Rc..
Blade Finish: Black Oxide. Handles: Sculptured Micarta. Sheath: Dark Tan Leather Sheath.